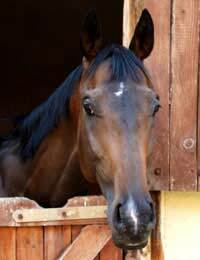 Many horse owners choose to keep their horses in livery yards. These can provide the easiest, and often most cost-effective, way to care for your animal. But choosing a livery can be a difficult prospect. There are many different factors to bear in mind – and you should make sure that you think carefully before making a decision. There are several types of livery arrangement. These range from full livery, in which pretty much everything is taken care of for you, to DIY livery, in which all that is provided is a stable and a paddock. You might also encounter working liveries, in which you get a favourable rate in exchange for the use of your horse in lessons, and part livery, in which you must exercise your horse but tasks like mucking out are done for you. What about bedding and feed? Some yards demand that the same type of feed and bedding is used for all horses. This can cause problems if your horse has an allergy – and this is very common. You should also check whether you can bring your own bedding and feed, or if you will be required to buy them from the yard’s preferred supplier. It is common for yards to arrange for vets to visit on a regular set day, in order to see every horse at once. Of course, this might not be suitable for you. You should check to see when these visits will be made, and what sort of attention your horse will receive. What about access to facilities? Every yard has its own rules with regard to the use of facilities. Many yards have arenas or courses, but whether or not you are allowed to use them will depend on your arrangement. You should also ask about the times at which you will have access to these facilities, and whether they operate on a rota system. Where is their bridleway access? Bridleway access is vital if you want to hack outside the yard. Check on a map, and ask the yard owners. Remember that not all bridleways will be marked on every map. Given that you will have to deal with them at close quarters, and that you will be entrusting them with your horse, it is important that you get on well with them. Try to meet as many people as you can when you visit. What are the turnout times? Turnout should be one of your main concerns. How frequently will your horse be turned out, and how long will it have outside? Will it be turned out only with horses of the same gender? How will it be supervised? Make sure that you ask these questions when you visit. There is a range of approval schemes to which yards can sign up. You might want to check the British Horse Society’s Approved Yard Scheme for details of your nearest approved livery. This offers some peace of mind that good standards of welfare will be met.